December 20, 2015 ~ Santa Came Early | Whatever! « December 18 ~ Quick! Catch-up! Santa made an early visit to our house today. Twice. Once by airmail, and the second by firetruck! Thanks to the local fire department. We let the girls open their presents from their Nana and Aunt Em this morning. Topsy Turvy dolls that Nana had hand knit along with a personalized knit ornament for the tree and a book to match their doll. They both LOVED them and didn’t put the dolls down for the rest of the day. Each asked for their book to be read at bedtime. Later this afternoon, after some quiet time, we heard a siren outside. We all got up to see what was up, and they saw the truck come down and around the corner. At first they had no idea what was going on, we usually don’t get firetrucks on our road. Once they saw Santa get out they got excited, totally surprised. They were still a bit curious. They knew it wasn’t Christmas yet. It hadn’t even been LaLa’s birthday yet. Thankfully they were super polite as Santa came up and told them he was doing an early delivery today, and asked if they wanted a present. Both said “yes, please” with no prompting. Almost no prompting. Ashlin started her excited jump, but was able to stand still long enough for a candy cane and a picture. Notice, there is much less fear on her face than the last time she sat with Santa. Yay! Stu and I hustled them in as the truck drove away, they were so eager to open their presents. The Santa ones. Watching their joy as they ripped off the wrapping paper was worth the small fee to have the special delivery. Ashlin was able to get her present unwrapped first and her head exploded. 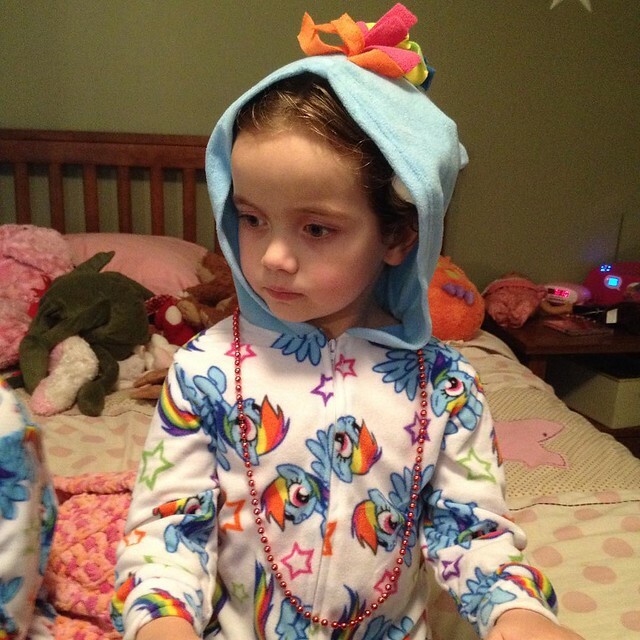 Rainbow Dash pajamas with a hood with ears and a rainbow mane. 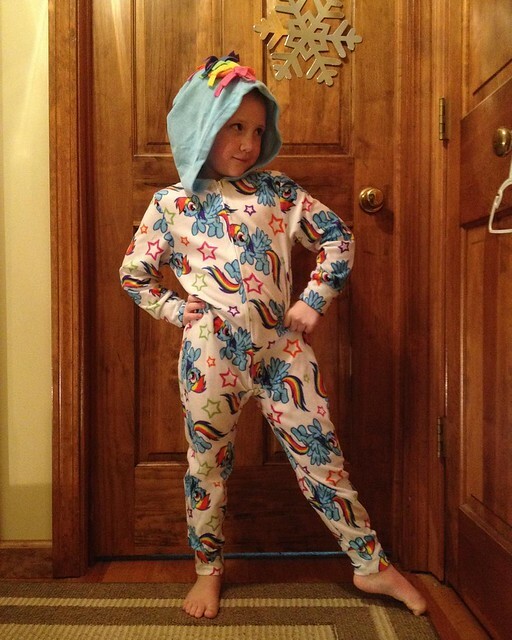 They’re footie pj’s without the feet, one piece with a zip. We got “I love them!” from both girls, and “this is the best day ever” – over and over – from Ashlin. Neither girl could wait for bedtime to put them on. Yeah. I got them matching pajamas. With a hood. I am an awesome mom!